I’m so excited to work on my first AYOS Schnibble project. I received my layer cake of Lario (a new 3 Sisters collection by Moda) on Thursday. Green Fairy has great online deals quite often (and if you come across them – they also do bids on eBay which can land you even better opportunities), and no shipping charge anymore (eBay purchases do have shipping)! You should see my collection of green pens (you get one free in your order). Can you say ‘office supply store’? 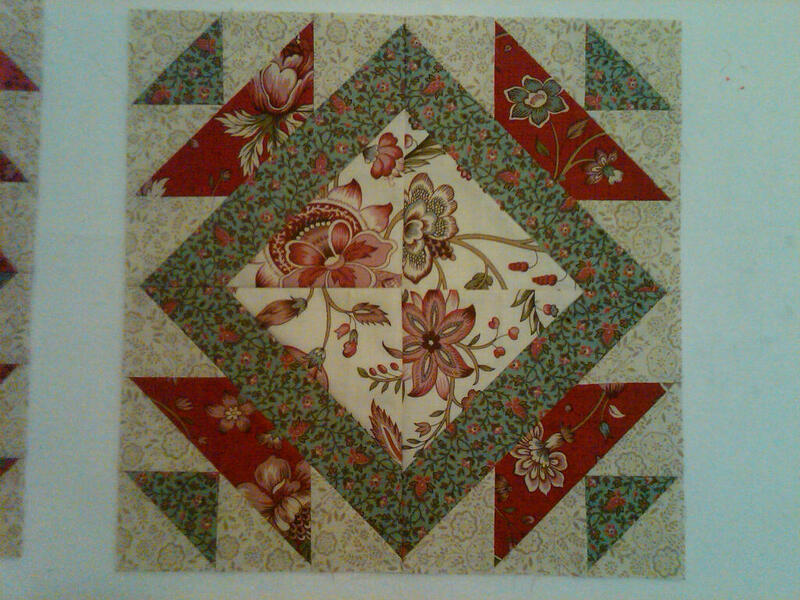 Here’s my progress on the first Schnibble of 2013 … Hat Trick by Carrie Nelson of Miss Rosie’s Quilt Company. For more information on joining AYOS (Another Year of Schnibbles) – just click on the blog button in the right side bar, and it will take you to one of the hostesses of the progam – Ms. Sinta of Pink Pincushion. 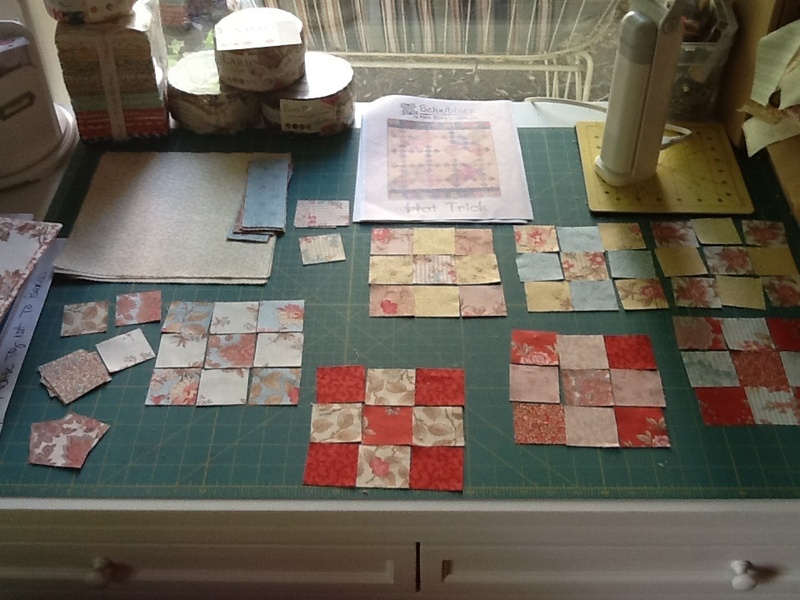 I’m having fun pairing up the color options and even doing a little ‘controlled scrappy’ approach to the 9 patch units. 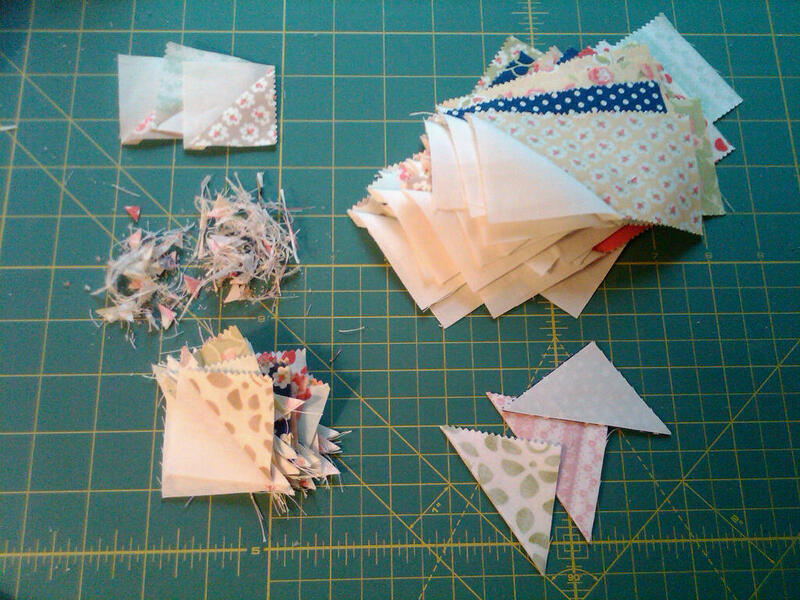 The instructions even suggest to go with the individual 2 inch square construction instead of strip piecing these blocks. I’m getting great practice at both perfecting my 1/4″ seam allowance and using my seam ripper. Then I discovered that ‘someone’ had slightly moved my needle position knob on the sewing machine. That could make a difference – right? Today, the family is getting ready to go out to the Houston Pet Expo this morning and peruse the exhibits and animals up for adoption. Never been before. I have my eye on two kittens that will be available for adoption soon, and they will be at the Expo today with their sweet rescue group, … Dori’s Darlings. It’s been over four years since my last furbaby passed away and I have missed the company of a quiet, cuddle partner. Let me emphasize quiet. Have a beautiful weekend! Thanks for stopping by! Short and sweet update today. I have the auditors in the office for our annual reviews. Lots of paper shuffling and printing, excel spreadsheets, reconciliations, etc… Fun by all! It is the beginning of another month, which means another Blogger Girls BOM block has been released! 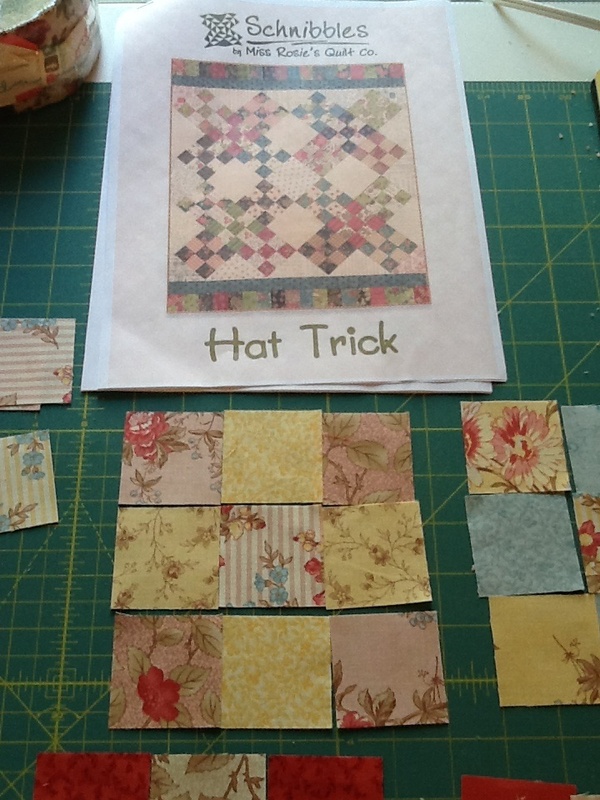 I finished up the second, alternate layout, block last night so I can both share my results with you and link up to Pink Pincushion’s BOM Rehab (a day late). 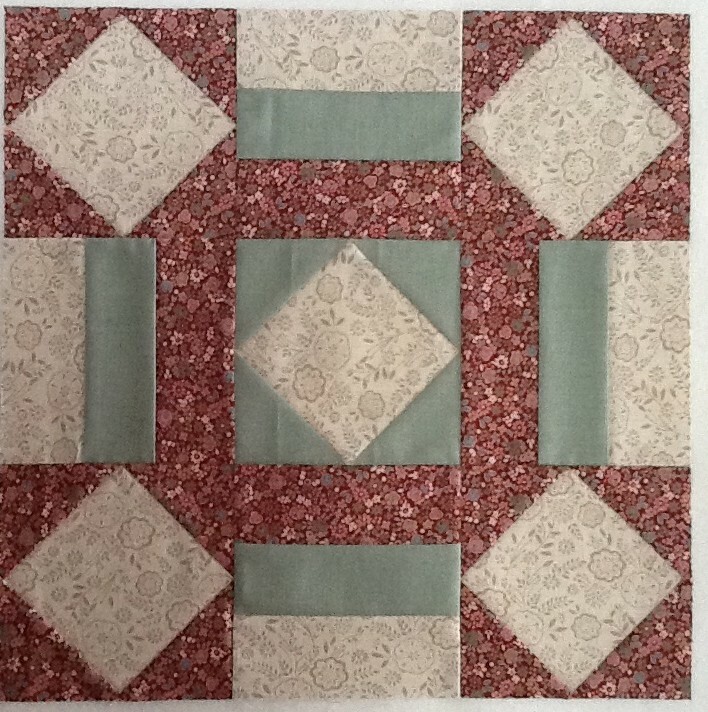 Here’s the same pattern for this block, but in an alternate fabric layout. You will also note that each month I do one in a red/green colorway and one in a red/blue colorway. 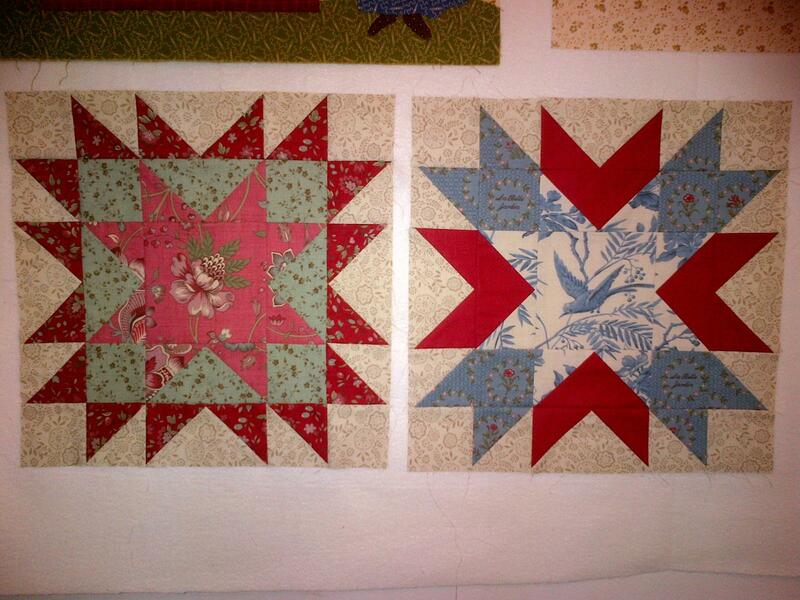 Now that I have 8 blocks on my design wall, I can see that they are going to look great together in the end! So – knock down Blogger Girl BOM for April and another week of BOM Rehab with the same two blocks! Efficient. On the LOST front … I just finished Season 2 last night and watched the first episode of Season 3. Can you believe what Michael did? I did NOT see that coming. I’m on the edge of my office chair now, waiting for my lunch break so I can get in another episode. Have a fantastic week and thanks for stopping by! Hello Thursday! So glad you could make it again this week. And thankful that you are already half-way over! Wrapping up a lunch hour in front of my computer, trying my best to stay awake after a very long week at work. 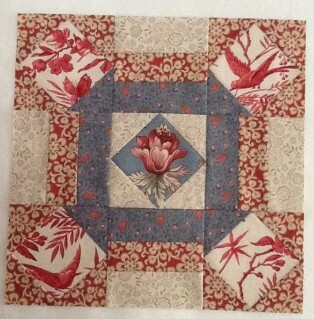 I didn’t help myself much last night with a very late finish to the Blogger Girls BOM – Block 2 alternate block. But I got it done! I’m STILL cutting off a lot of those outside points !@#$!@$. I’m going to have to figure that out before I do the next set. 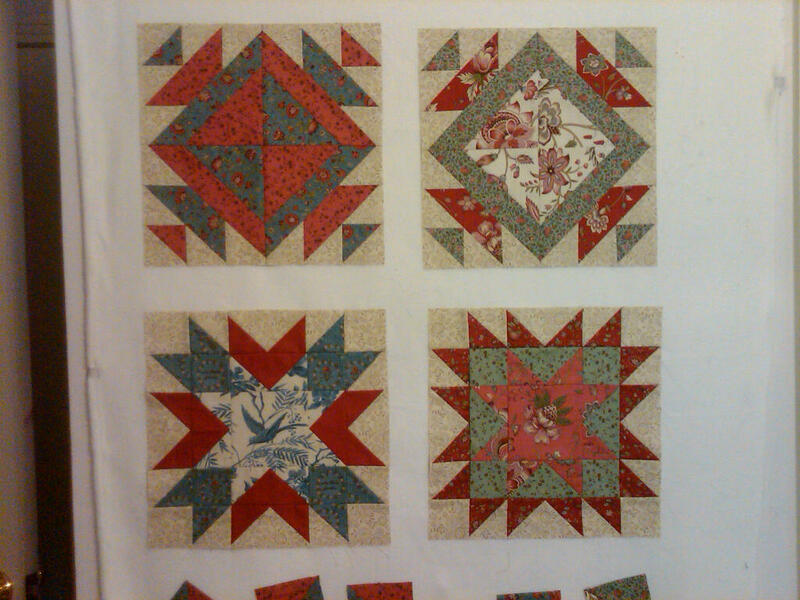 And, here are all four blocks done! I’m actually caught up on this BOM! 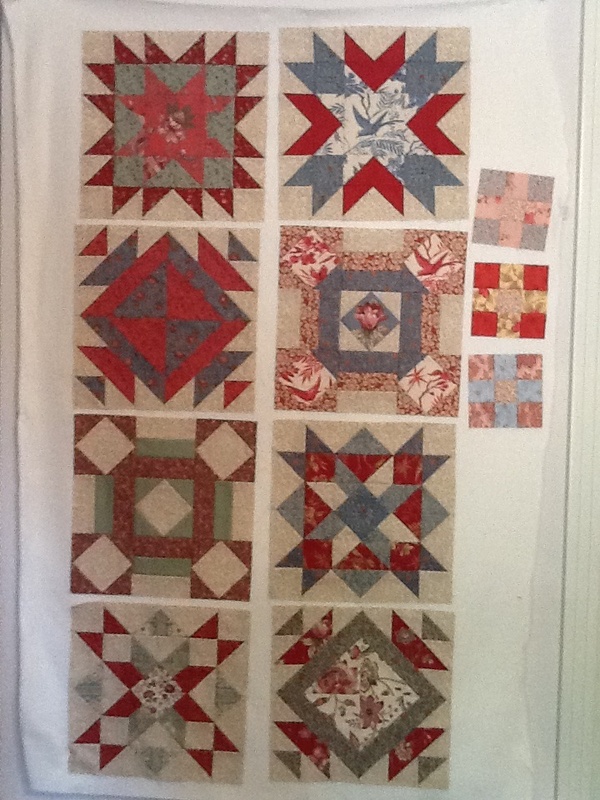 But, to comment more on my blog header for today … I have been considering doing a quilt pattern by Kim Diehl for some time. I love the ‘just enough folksy’ aspect of her designs. I wouldn’t want too many really dark quilts (she uses a lot of rich, dark fabrics) – but, I could use at least one in my WIP (lol). So… although I had browsed her books and internet pictures and such, I had not taken the plunge. 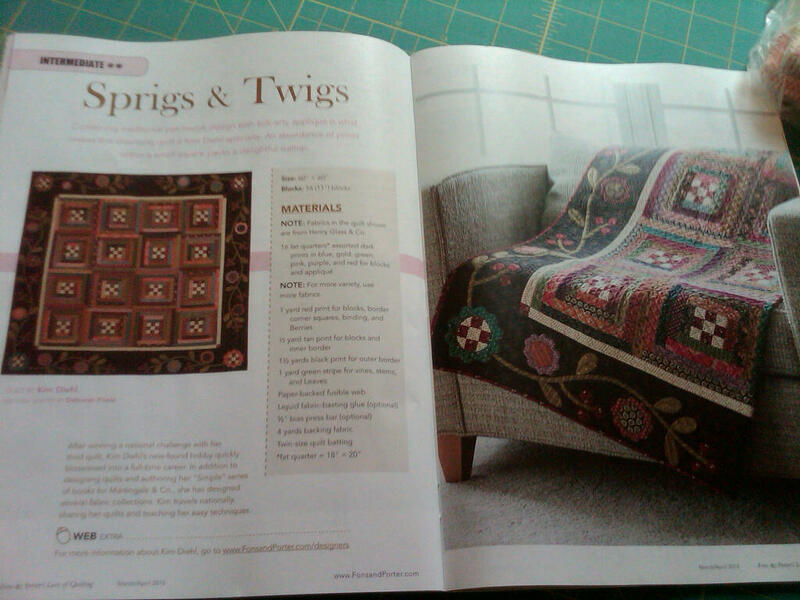 I came across this pattern yesterday in the latest Fons & Porter magazing (March/April 2013). Disclaimer: I don’t know if it is illegal to show these pictures, but since I can count on my two hands the number of people who actually visit my blog – I thought I would take the chance. Worst thing that could happen is someone will be inspired to buy a copy of the magazine. Right? 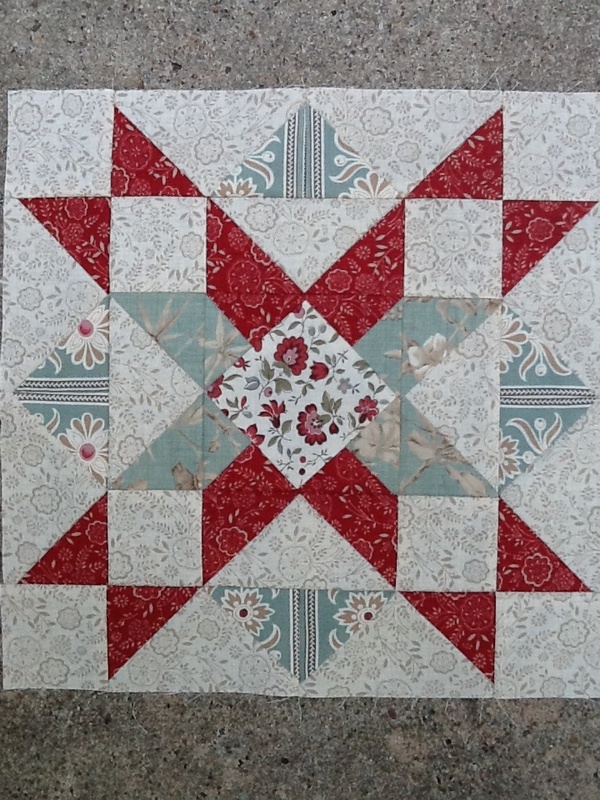 I LOVE those nine patch blocks that are made into the center of the four corner flowers. And the bias stripe fabric for the stems and vines are adorable. 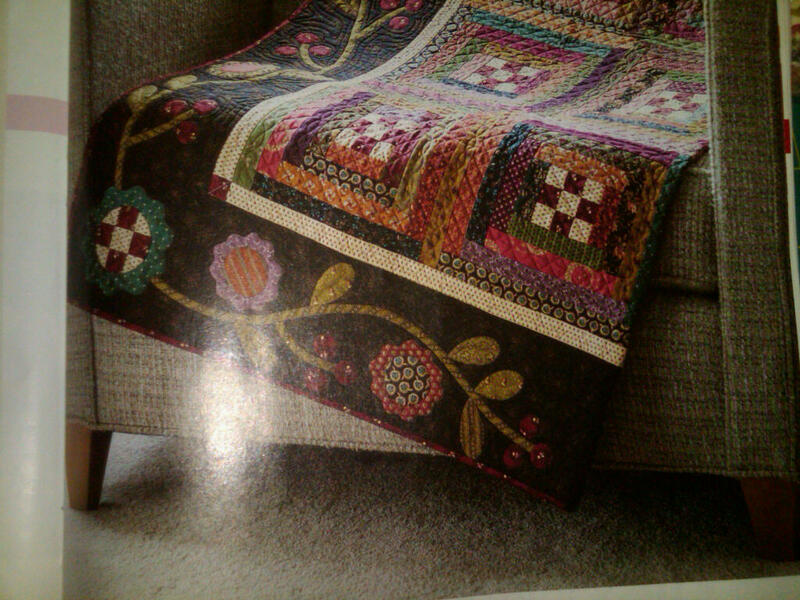 I felt myself getting so totally excited about this quilt. I haven’t stopped thinking about it, so I figured it is in my future. 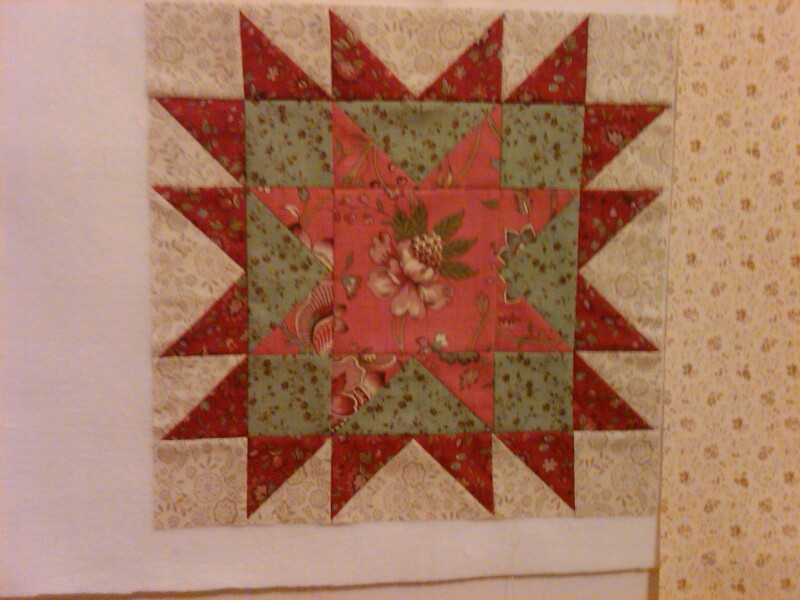 I have enough reproduction fabrics to make the center part, but I didn’t have anything really to be used for the black border. Took care of that this morning with a quick order to FQS! 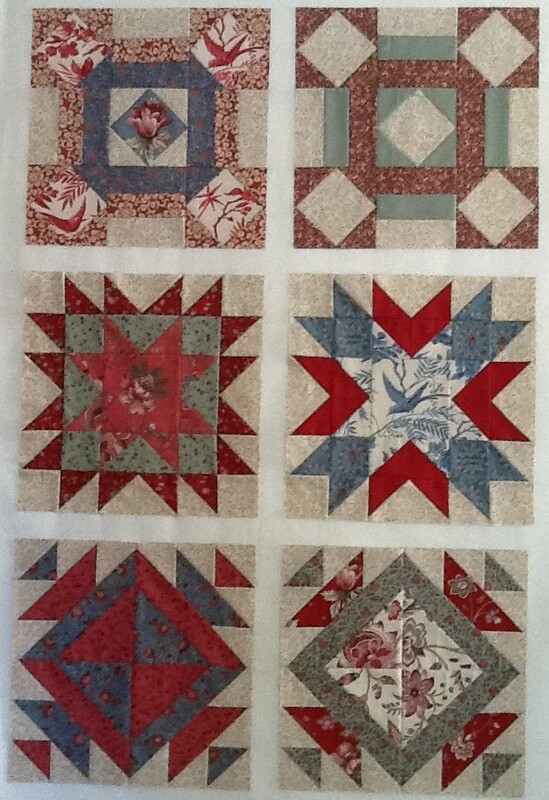 I have two fabrics selected from the Kansas Troubles Favorites collection. I’ll decide which one works better on the scale of the print once I see them in person and audition them with my other fabrics. 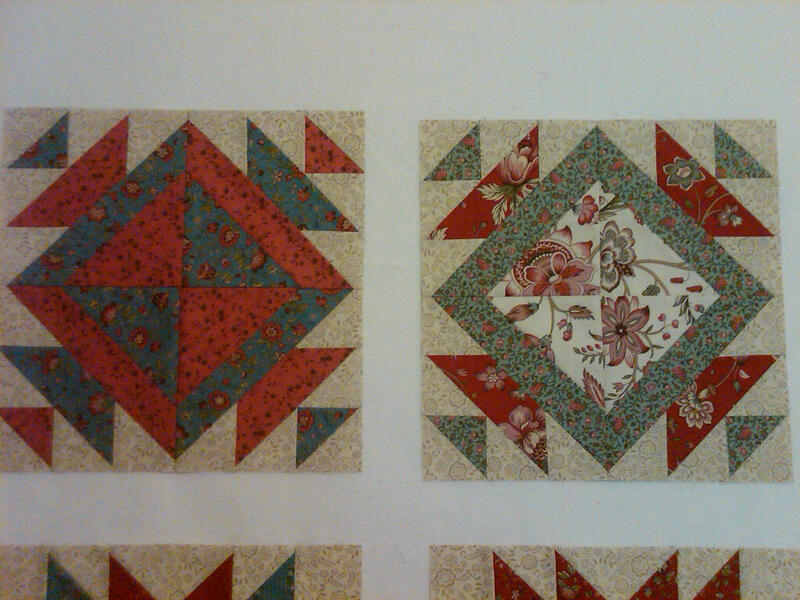 I think I favor the top one, with the little daisies… but it may be too busy – or it may be perfect! I’m not sure yet. I’ll keep you posted. I hope you find something that lights your fire today! All the best! I want to do what I want to do! My headline is a quote taken from my 6 year old son. I can emphasize completely, but as we grow older, we learn to compromise on our desires and our obligations. He hasn’t mastered this yet, and honestly isn’t really trying either. But, who can blame him. Life is short and then you die. No really, I do parent better than that – but it is a good transition into my post for today! I came across this blog entry yesterday that captured the essence wonderfully. Take a read if you have a chance. 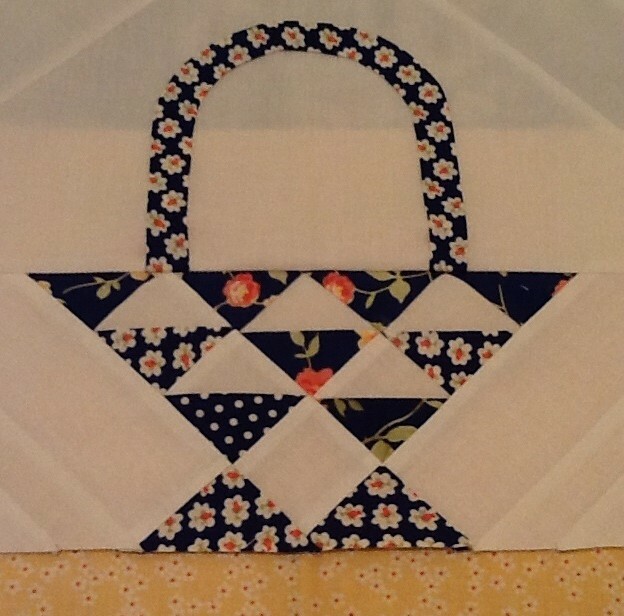 It is from a blog called Quilting Daze. I was either laughing out loud or shaking my head in agreement while I read it. So, this leads me to my activities for today. 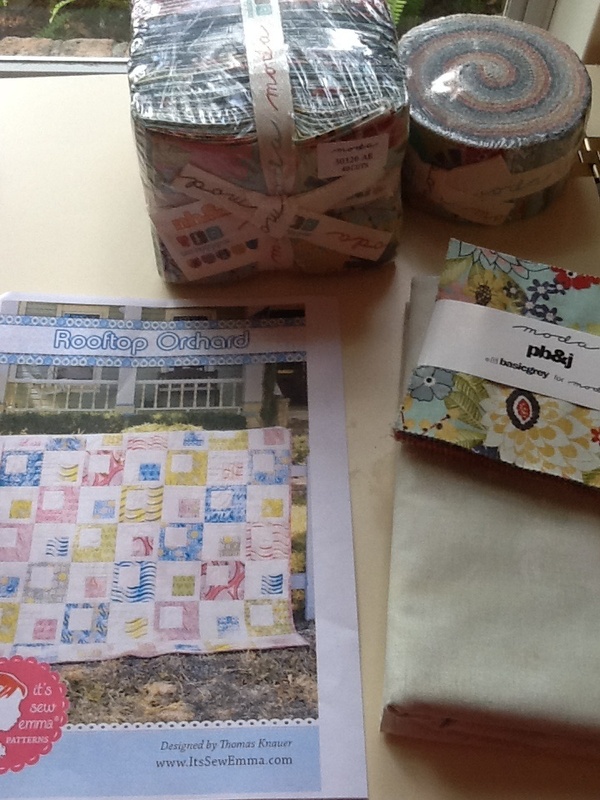 I jumped at the chance to get a jelly roll and charm pack of the newest collection from Fig Tree Quilts called AVALON. It won’t be in stores (and when I say stores, I generally mean The Fat Quarter Shop) until March 2013. However, I usually find the precuts showing up on eBay well before then. I didn’t want to just sit on my new treasure too long. 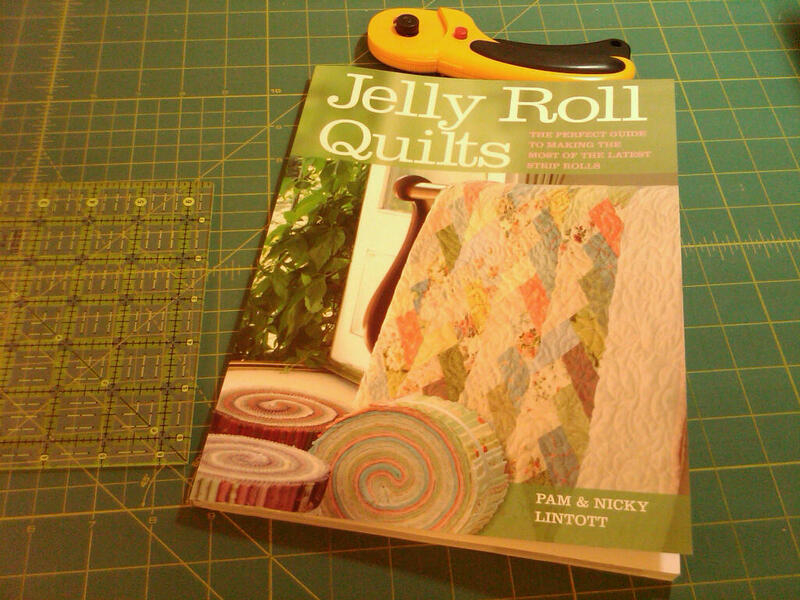 I really, really wanted to do a quick jelly roll quilt and see something produced from these fresh colors immediately. Some instant gratification! Got it at a great price during a Joann sale – 40% off this week! 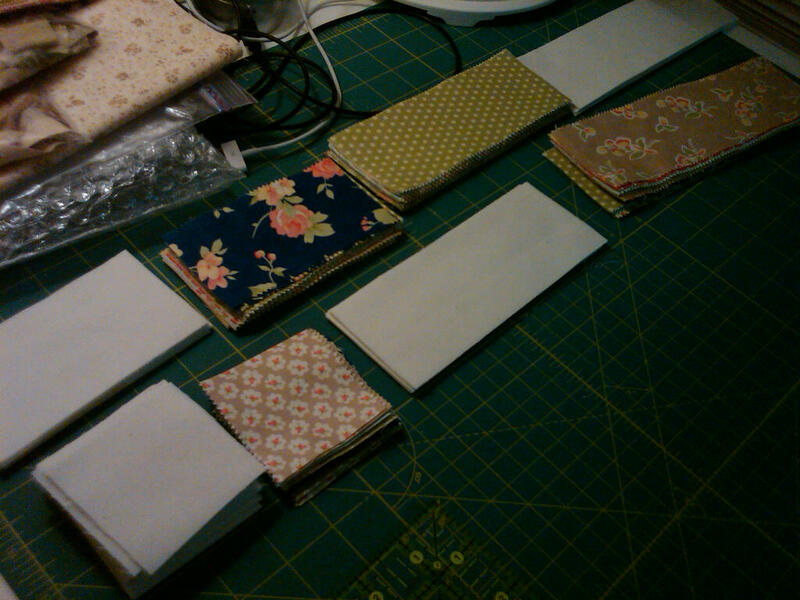 Most of these strips are combined with a white/background square on one end and then trimmed corner to corner. I recently watched a Fons & Porter Love of Quilting episode where they shared tips on stitching these little leftovers and made a little doll blanket out of them. So I thought I would try to make use of my scrap corners too! Starting from the top right corner and moving clockwise… I had the strips sewn, trimmed the corners off, kept the fabric together and ran them through the machine, then pressed to the printed fabric and trimmed them down to 1 3/4 ” square. Notice what my leftovers look like now. Barely enough threads in that pile to even save for my stuffing bag. 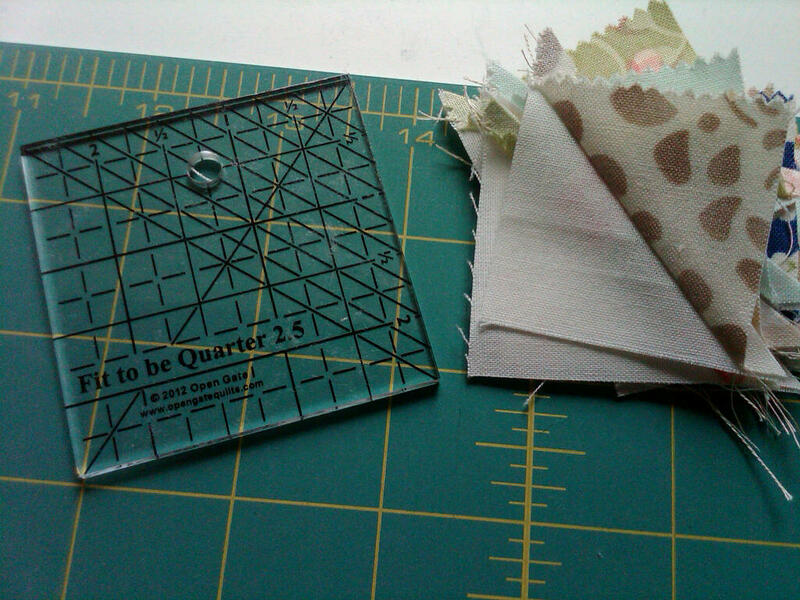 A great tool I used for this was the Fit to be Quarter 2.5 ruler from Open Gate Quilts. 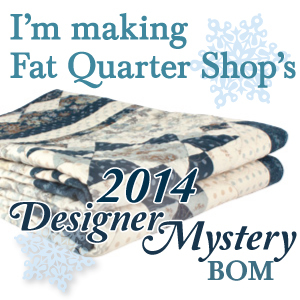 I got it with my purchase of another ruler from their site for the Blogger Girls BOM project. It worked GREAT for this task. 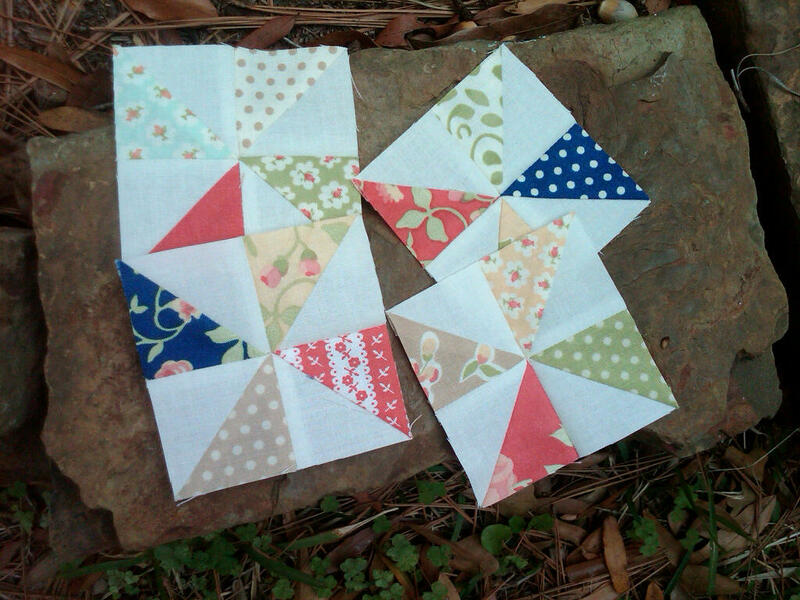 Here is what I did with my little half square triangle units! Aren’t they ADORABLE? 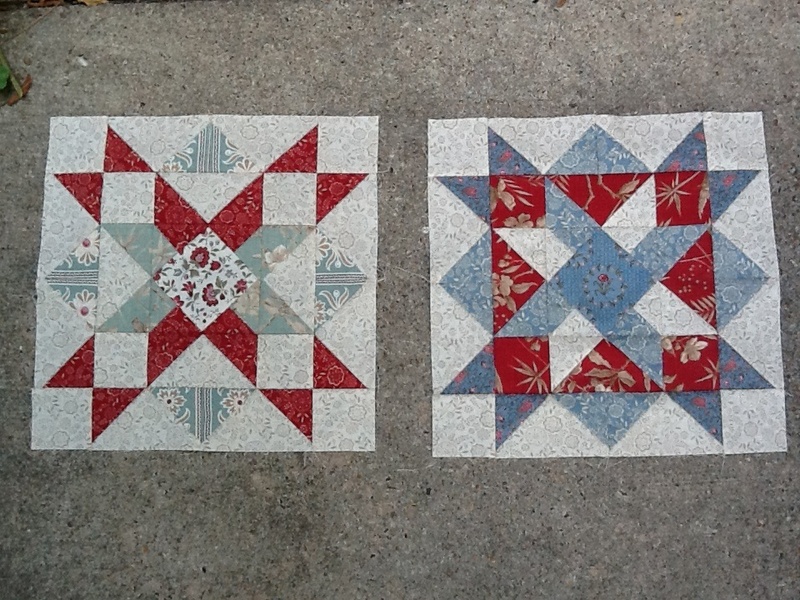 They are 3″ square, unfinished. And I LOVE this fabric – did I say that already? These will be set on point and I will use all but 4 strips from my jelly roll and I had all but 1 yard of background fabric in my stash for it already. I’m using Bella Porcelain solid as the background. I’ll finish up today with a look at my design wall as of this morning. 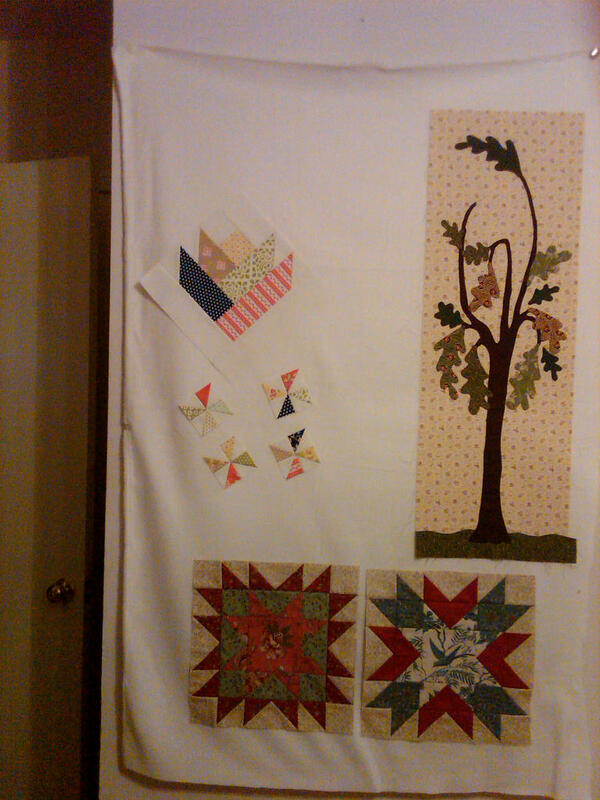 I even added a couple more leaves to my AFH tree! I definitely did what I wanted to do for sure this past weekend. I hope to continue that this week, because I’m loving my new project. Also, can’t wait for the next block from the Blogger Girls BOM to be released on Friday! It’s not one thing … it’s another! 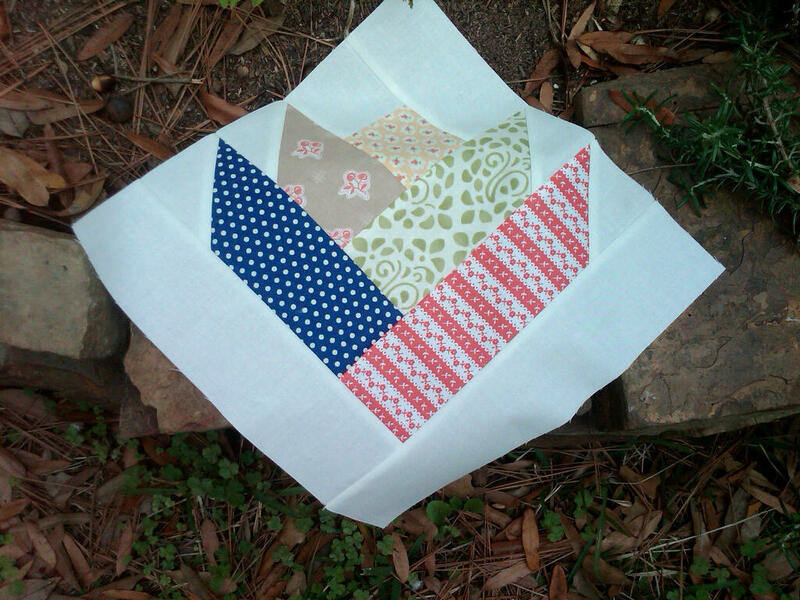 Good news for quilting – I got my first block sewn together yesterday for Blogger Girls BOM. Here is it on my design wall. Ignore the background fabric beside it – goes to something else… Picture is blurry, sorry. Points came out great. 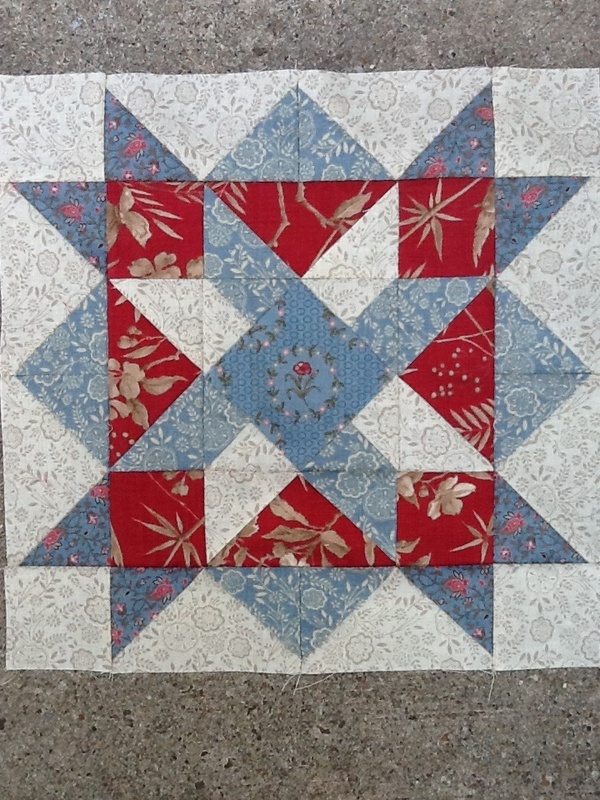 First time using the Fit to Be Geese ruler by Open Gate Quilts. It worked just as promised and there’s less waste to this method than my rectangle with two squares method. Perfect points and seam allowances. However, it looks like I will be cutting off some of the points when I add it into sashing – when I trimmed it down to 12 1/2 inches, it took away more allowance than I would have wanted. Don’t look too closely I guess. I’m trying to close out December and the year today and tomorrow at work, so late nights. However – after joining hundreds of other germ factories at the local Children’s Museum this weekend – my daughter caught a bug and ran a fever with sore throat last night. She’s still asleep this morning (at 10:30 am). Husband just sent a text message that son is also having odd symptoms. SO… if it isn’t one thing, it will always be another. Got to go and try to speed through my work, so I can go do some good cuddle time with the babies.